"An excellent service, I can highly recommend." "Very efficient service! Will be in touch". "French Riviera Rentals and our guests have always appreciated your 5 star service! " "Proved to be a reliable and inexpensive service while on holiday last year. We are pleased to recommend and will definitely use DST next year." "We have used DST for many of our clients with complete satisfaction and repeat bookings." 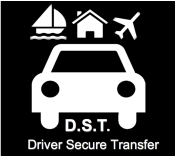 "I have called on DST on 3 occasions for clients arriving in Nice and needing airport pick up and drop off services. Always on time, always discreet, and always helpful." driver was polite and pleasant at all all times. Many thanks and I will use your company again if I'm in the area. "A quick note to say than k you for the efficient service and welcome given. Hopefully, we shall see you next time we visit Antibes." D.S.T. was in the Riviera Reporter February/March 2015 issue.